Don’t risk dealing with frozen or cracked pipes now that the temperature is dropping. Just follow these basic preventative maintenance tips instead! We’re experiencing big drops in temperatures already and for homeowners, that means all kinds of winterizing and seasonal concerns. 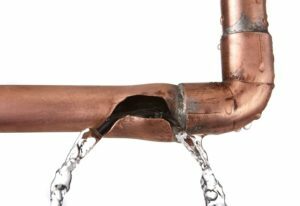 When it comes to your home plumbing, dealing with frozen water lines, cracked pipes, and bursting plumbing fixtures is just about the least appealing thought imaginable. The good news is that a bit of mindfulness and some basic know-how can help you prevent frozen or cracked pipes in the upcoming cold weather. Starting to worry about cold water freezing your pipes? Dripping hot and cold water is a good way to keep water moving through pipes and can help relieve some of that built-up water pressure. If you have single lever faucets, set them in the center so that you’re using both water lines—cold and hot. This is especially important if the pipes are running in outside walls, as those are more likely to freeze over. Most kitchen sinks are on an outside wall, exposing them to especially cold conditions. One thing you can do is leave your cabinet doors open for cabinets that house plumbing elements. This can prevent cold air from building up and causing the pipe to freeze. It’s getting about the time where you may want to consider disconnecting your house from the outside faucet. The danger of leaving a hose connected during below-freezing temperatures is that your hose bib won’t drain and could end up freezing and causing damage. If your home isn’t properly insulated, this means many spaces end up getting colder than they otherwise would. This is especially true of basements, within walls, and in cabinets, all places that tend to get colder than the rest of your home since they’re not typical living spaces. You may not think to insulate these areas because it doesn’t impact your comfort, but it goes a long way in protecting your plumbing. There are a number of products out there that are designed to tackle this problem specifically. This includes things like tape that is meant to be wrapped around pipes and help insulate them or even freeze alarms that let you know if your indoor temperatures drop too low. If you’re really concerned about your pipes being damaged, call a local plumber to take a look at your home and see if anything can be done to better protect your pipes. With the years of experience to back their advice and decisions, they can protect you from future problems. This entry was posted on Friday, October 26th, 2018 at 2:47 pm. Both comments and pings are currently closed.